This is such a popular version of brownies, I don't need to tell you much about it ! The legendary actress, Katharine Hepburn shared her family's signature brownies recipe during an interview with a magazine and ever since they published it in 1975, so many, including Saveur magazine and n number of blogs reprinted it. Here is my version slightly adapted from Epicurious. 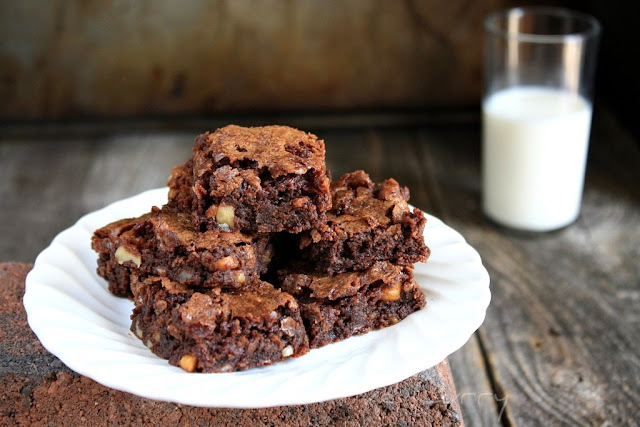 These brownies are incredibly chewy though the upper crust is crispy. 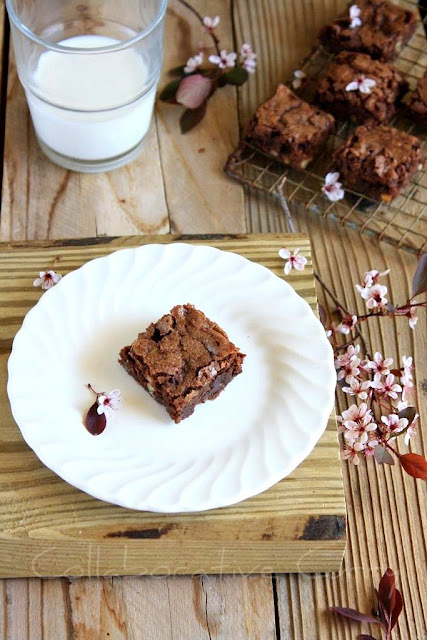 These are as classy as the wonderful actress.The chocolate flavor is mellow and this is a one bowl recipe, that you can easily whip up.So if you are a person who loves chocolate brownies, I highly recommend you try this soon, if you haven't done so far. I have this weakness,whenever I see a nice brownies recipe, I try it. This is the fourth kind of brownies I'm posting here on Collaborative Curry. If you are like me, and love different kind of brownies do check these Classic Brownies,Cream Cheese Brownies and Rocky Road Brownies I have posted earlier.This definitely means, there will be more brownies posts coming up in the future,stay tuned! How are you all enjoying Spring so far ? It has been raining here and rains make me quite nostalgic ! Most of you know that I grew up in Kerala where monsoons take over major part of the seasons. I really miss monsoons here, but I'm glad that we get some rain in Spring and Summer in Colorado.Have a great rest of the Spring and I hope you will make these brownies soon and will fall in love with it,like we did ! 1.Preheat oven at 325 degree F.Line a 8 by 8 inch square pan or a 11 by 7 inch pan with parchment paper and lightly grease by spraying some cooking oil. 2.Melt the butter and chocolate on a double boiler or very carefully in a microwave oven, stirring well. 3.Stir in the sugar.Add the eggs and stir together. 4.Mix in vanilla and salt. 5.Add the flour and walnut,stir until incorporated. 6.Pour the batter in the prepared pan and bake for 40-45 minutes.Cool on a wire rack before cutting and serving. Oh my, they look super scrumptious, Namitha!!! wonderful recipe...brownies should always be lil fudgy at the center. you baked it perfectly. Wonderful recipe and the pictures are too gud !! Ooh so chewy moist brownies! !I can almost taste the deliciousness in these :)Lovely clicks!! These look so moist and delicious! 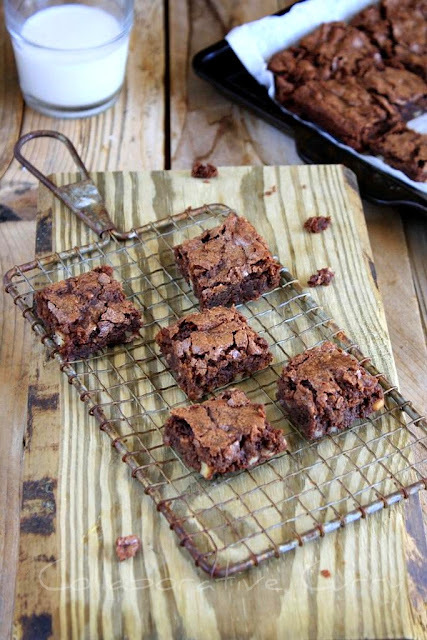 I'm on a never-ending search to find a good brownie recipe, so I'll have to give this one a go! Super looking brownies and clicks..
-Ph wow, these look perfect! :) What a treat - who knew the lady was as amazing a baker as an actress? Seriously u are killing me with ur clicks, just drooling here..wat a fabulous treat! there can never be too many brownies in this planet! Those look so good! I am a sucker for brownies. So this is THE famous recipe from the Actress...The pics are solive and tempting that I feel like running to my kitchen for the same..
Gorgeous photos! I've heard great things about these brownies, and they look so so good! awesum luking brownies..loved the pics...nice one n easy to make..
Katharine Hepburn is my mom's favorite actress, yet we didn't know she has a famous brownie recipe! Cool! I bookmarked and I want to surprise her one day. 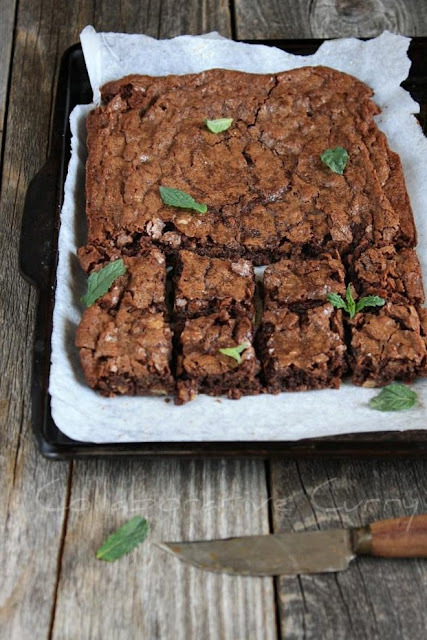 =) Looks delish and I love how you style the brownie - beautiful job! I love brownies and these look amazing! Love how chocolaty and moist these look. Just feel like grabbing one right away. I didn't know about this brownie, looks absolutely gorgeous those slices. Must give this brownie recipe a try. They are so tempting. wow..these brownies r a must try !!!! !loved it absolutely n bookmarked ! I do love brownies! I have never seen this one but it looks wonderful.